Cosplay City Championship (C3) Superstars Competition is a handmade cosplay competition. Fabric Master for best sewing work. If you enter as a pair then the prize will be split between you. The competition is open to all cosplayers over the age of 15. To enter you must have a valid ticket to the event where the competition is being held. To enter the C3 Superstars you will need to register and apply online (we recommend registering as early as possible before the convention). There will be no entry on the day. Registration will close at 5pm on the Wednesday before the event. They will be emailed confirmation of entry within 1-2 days of submitting. Cosplayers can only enter as individuals or groups of no more than two for this competition. Costumes are permitted from any form of popular media. This includes, but is not limited to, comic books, films and television, video games, anime & manga and tabletop gaming. Costumes must be based on an existing source as a reference picture must be provided. We allow genderbent and gijinka designs as long as you have reference images to support them. Costumes are expected to conform to a certain level of decency as this is a family event. Costumes considered inappropriate will not be allowed to enter C3 Superstars. If you are unsure if your costume is suitable, please email cosplaycitychampionship@gmail.com to discuss. 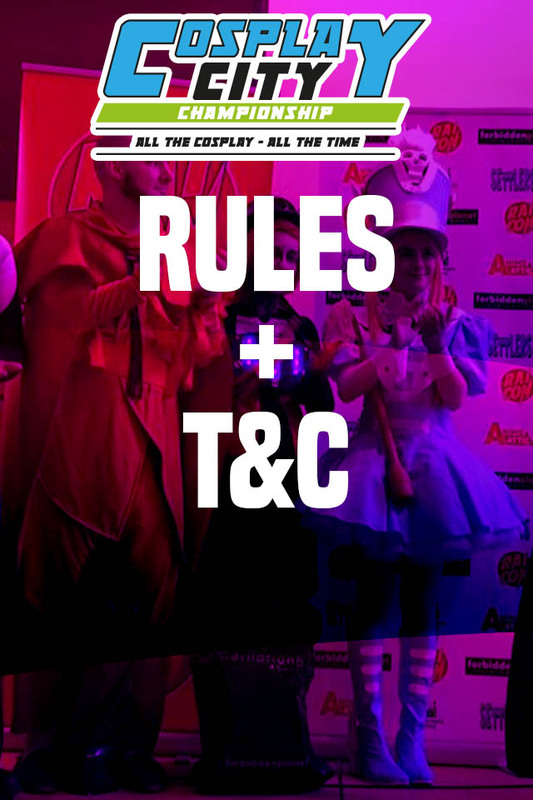 You are not permitted to enter with a cosplay that has WON in any other competition, within the UK or internationally. The jury will be made up of a panel of up to 3 industry guests and respected cosplayers. Each judge will award a maximum of 30 points to each costume. 10 points for accuracy and likeness – similarity to reference picture provided, therefore it is in your best interest to provide a good reference image. The judges will also look at how you have used makeup and wig-craft to create a good likeness. 15 points for craftsmanship – This will consider the overall complexity of the costume and any props as well as its neatness. Points also given for good use of makeup and hair. Any unusual materials or techniques will be rewarded with extra points. The majority of these marks will be allocated during pre-judging. 5 points for stage presence – Your charisma on stage, poses and confidence. Judges will use these points as a guideline when making their final decision. Points will not be revealed to anyone outside of the judging and organising panel, including the contestant in question. You are more than welcome to ask the judges for feedback after the competition. All contestants are asked to attend a pre-judging session at the event on the day of the contest. After registration closes, each entry will be given a timeslot for their pre judging session via email (cosplaycitychampionship@gmail.com). So please be sure to check your email regularly. Contestants must be ready in their costumes and arrive at the cosplay desk at least 10 minutes before the time given. Anyone who arrives more than 5 minutes late for their session risks missing out on pre-judging and losing most of the points in the craftsmanship category. During pre-judging the judges may ask questions about how elements of the costume were constructed. If parts of the costume were constructed by someone else, you may bring them into the pre-judging with you. You bring as many reference images and progress photos to pre judging as you wish. A progress book will not be required for this competition; however, you may bring an evidence portfolio or progress photos with you, to illustrate your work. If you incorrectly declare elements of the costume to be hand-made or crafted by yourself then you will risk being disqualified from this competition as well as all future C3 Superstars competitions run by Cosplay City Championship. This is to ensure the competition is as fair as possible. All entrants must provide a reference picture of the character you are cosplaying in the outfit you are wearing for the judges. This is an image from the show or comic – not a photo of you in the costume. You can attach as many reference images as you wish- the more the better. We recommend making an album on imgr. Your reference images should be attached as a link on the online application or emailed to cosplaycitychampionship@gmail.com with your name and the character name used on the online application form. The larger and higher resolution, the easier it will be to judge. Reference pictures will not be returned so ensure it is a printed sheet and not a book or poster. Failure to provide a reference picture will result in zero points for accuracy. You must be at the Cosplay desk 30 minutes before the competition starts for an information brief and to be taken to the stage. Contestants will walk onto the stage to pose for no longer than 30 seconds and then leave the stage. We encourage you to be as flamboyant as possible during your time on stage. If you require a microphone for a spoken performance then please let the Cosplay Desk know when you come for judging. Please do not swear or use offensive language on stage, you risk being banned from future events if you do If you would like to provide your own music then please let us know on your cosplay application form, and bring it on a usb stick on the day, or email it to cosplaycitychampionship@gmail.com If you do not provide music then it will be provided by us. Please do not throw or fire any projectiles into crowd whilst on stage. This is dangerous and you risk being disqualified. Judges decisions are final and discussion about the decisions will not be entered in to with any contestant or member of the public by the judging panel. Prizes will be awarded after the masquerade at the closing ceremony. If the winners are not present, their prize will be held for them till they can collect it, or if need be, it can be posted to them. Prizes cannot be collected by another individual on their behalf unless signed permission is given at the cosplay desk. Should a contestant be found to have mislead judges within 3 weeks of the competition then an investigation will be held. Should they be disqualified, the prize will be awarded to the next highest scoring contestant. Any issues that arise after this three week period will be taken into consideration but no action will be taken other than to ban contestant from participating in any future C3 Superstars competition. All contestants are asked to act in a respectful manner to staff and other contestants. Any form of physical or verbal violence, vandalism or theft will result in immediate disqualification. Attic Events and the Cosplay Team reserve the right to amend or update these rules at any time. You may be filmed or photographed during the Cosplay competitions and Attic Events (Cosplay City Championship) or its associates may wish to use your image. By entering the competition you are agreeing to your image being used by Attic Events (Cosplay City Championship) and affiliates for advertising and promotional purposes and any other reasonable purpose. 1. Participants agree to take part and will be featured in marketing and publicity material for Attic Events and affiliates as required, as well as external media viewable by the general public, including but not limited to newspapers, magazines and websites which may be out with the control of Attic Events. 2. Application forms and/or reference pictures cannot be returned under any circumstances. Evidence portfolios, however, will be returned provided they are collected on the day of the competition. 3. Personal information collected via the application form will be used for no purpose outside of the competition and will be destroyed after the event. 4. All personal information collected via the application form will be protected by Cosplay City Championship and will not be provided to any third party. Application forms will be destroyed once selection has been made and forms are no longer required. 5. Any application form found to contain false information will be removed from the selection process. Any cosplayer selected on the basis of false information will be forbidden to participate in the event and may be banned from future competitions. 6. Cosplay City Championships accepts no liability for any loss, damage, costs, expenses or claims suffered or incurred by any person as a consequence of any use of or inability to use this application process, the event website, or any related media content. It is the sole responsibility of the applicant and/or parents/guardian to confirm with Cosplay City Championships regarding any queries or questions they may have about application, selection and/or participation.